Mark Pollock, who has been blind since the age of 22, was seriously injured in a fall just four weeks before he and his girlfriend Simone George were to be married. 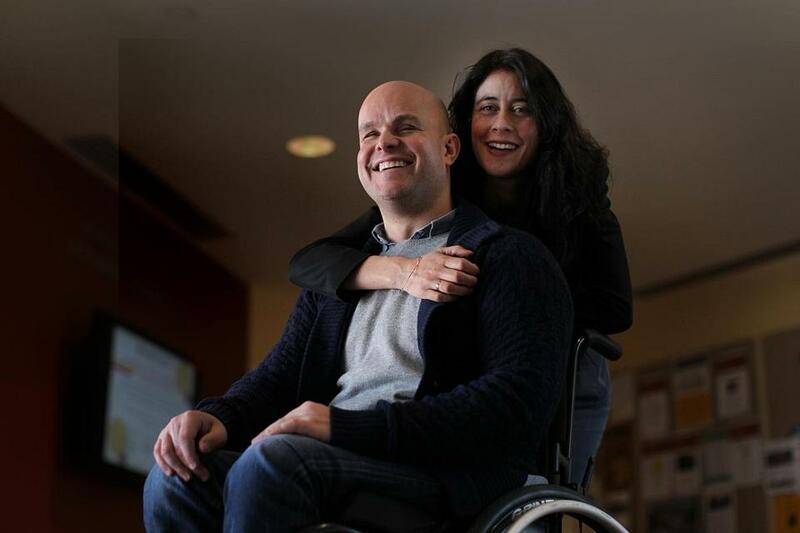 CAMBRIDGE — Mark Pollock was accustomed to facing challenges most people would never dream of when he suffered a setback three years ago that left him broken in body, if not in spirit. Blind since the age of 22, Pollock, a native of Northern Ireland, had conquered one frontier after another as an extreme adventure athlete. He’d run marathons in the Gobi Desert, in the shadow of Mt. Everest, and by the banks of the Dead Sea. In 2009, he became the first blind man to race to the South Pole on skis, a 22-day trek in temperatures that dipped into the minus-50s. A year later, Pollock co-skippered a boat in the Round Ireland Yacht Race, a grueling, 1,400-mile test of physical endurance and seamanship. His life story, compellingly told in “Making It Happen,” a book co-written with filmmaker Ross Whitaker, had made Pollock a sought-after motivational speaker. Corporations and charitable organizations clamored to hear the articulate young Irishman — Pollock majored at business and economics at Dublin’s Trinity College — speak about teamwork and perseverance. He had a dedicated support team and a loving, resourceful girlfriend by his side. “I was on the brink of the next phase — was — when the accident happened,” recalls Pollock, 37, who is spending two weeks at Harvard’s Kennedy School of Government this spring as a member of the Young Global Leaders Class of 2013, a group of under-40 leaders selected by the World Economic Forum. On July 2, 2010, Pollock and a group of friends were attending England’s Henley Royal Regatta. His fiancee, Simone George, a lawyer and writer, was off making wedding arrangements. The couple planned to be married four weeks later. Pollock trying out his robotic legs. That night, Pollock entered the house where he was staying, alone. What happened next is unclear. No one witnessed his movements, and Pollock has no memory of falling from a second-floor window. Plummeting 25 feet to the ground, he landed on his head and back, fracturing his skull and severely damaging his spine. In a stroke of fortune that likely saved his life, Pollock landed near a group of friends standing outside. They kept him breathing until an ambulance sped him to a local hospital. While miraculously suffering no serious brain damage, Pollock was paralyzed from the waist down. He spent over a year in a hospital bed, facing life as a paraplegic. While recovering, Pollock heard from admirers who’d read his book and heard him lecture. They quoted passages he’d written about hope and determination. Grateful for their support, he realized he could no longer will his broken body to do what it once had done. It was devastating for someone as competitively wired as Pollock had always been. 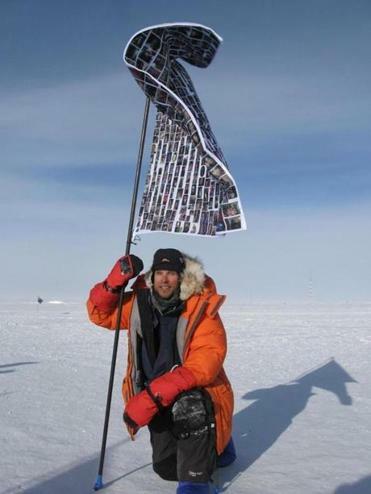 Pollock became the first blind man to race to the South Pole on skis in 2009. He tried getting back into adventure sports, says Pollock, who, even seated in a wheelchair, radiates physical strength. His upper body, once frail, has been resculpted by punishing gym workouts. 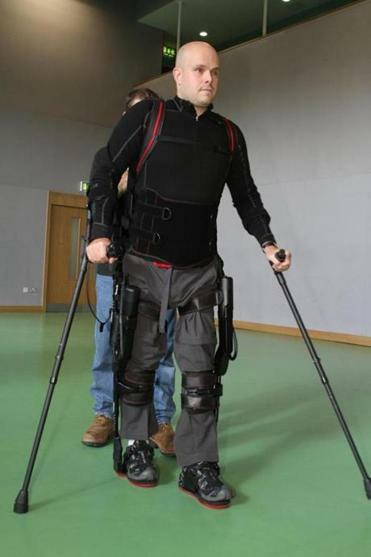 Aided by state-of-the-art robotic legs, he’s even begun walking again. Earlier this winter, Pollock entered a ski race in Siberia. Equipped with a specially designed hand bike, he was training in Norway when the race got canceled. Pollock is now thankful it did. Accompanying Pollock on his trip to the Boston area are his girlfriend George and A.J. Muminovic, a personal assistant. Back at his home in Dublin, his daily regimen typically consists of physical exercise, work on his foundation, the Mark Pollock Trust, and speaking engagements. While at the Kennedy School — he’s one of 65 Young Global Leaders taking classes and participating in leadership discussions this spring — Pollock has been meeting with local scientists specializing in nerve-regeneration research. Two are among a group receiving funds from the Wings for Life Spinal Cord Research Foundation, an organization for which Pollock raises money. His heroes include Christopher Reeve, whose foundation has poured millions into spinal-cord research. Reeve became a quadriplegic in 1995 and died in 2004. During those nine years, the actor focused worldwide attention on spinal-cord injury. Pollock admires Reeve for challenging experts who downplayed the prospects for finding an eventual cure. 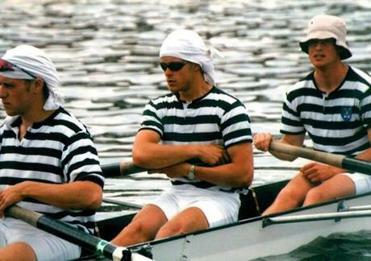 Before his injury, Pollock was a rower. Psychologically, Pollock admits, he’s struggled with his physical limitations, much as anyone in his condition might. Flashing a sense of humor, Pollock says his daily regimen often ends with a pint or two at a local Dublin pub. Or has until recently. In 2011, Pollock and George began exploring recovery options. He first flew to Southern California to meet with specialists at Project Walk, a rehabilitation center training patients with spinal cord injuries. The center’s mission is to get patients like Pollock in optimum physical shape, hoping to promote the regrowth of damaged nerve tissue. Pollock also ran a marathon in the Gobi Desert. Back in California last year, Pollock connected with Ekso Bionics, a high-tech firm that designs and manufactures robotic limbs. In October, Pollock became the first individual to take home a set of the company’s robotic legs for use in the gym where he trains. Recorded data from his walking sessions are transmitted back to Ekso Bionics, in real time. Meanwhile, Pollock is broadening his agenda from personal recovery to global research, aiming to facilitate more information sharing among patients, doctors, technicians, and funding sources. Young Global Leaders classmates could be an excellent resource, or so he hopes. Drawn from all sectors of society — science, government, business, the arts — this year’s group includes Chelsea Clinton, recording artist William Adams (a.k.a .will.i.am), statistician Nate Silver, and Nobel Peace Prize winner Tawakkul Karman of Yemen. Class members, 199 in all, serve a five-year term and meet as a group at least once a year.